If you’re a busy person who needs a quick, stunning, and cost-effective dessert, then you’ll want to try this recipe tonight! I haven’t had much time lately for baking with all the event planning for Winnipeg’s 1st Annual Chocoholics’ Buffet 2013 – benefiting the United Way of Winnipeg. But if you know me, you already know that I’m a serious Chocoholic! “Hi, my name is Anna, and I’m a Chocoholic”, so it was time to bake up something chocolate to satisfy my craving last week because all my advent calendar of chocolate truffles are history. You can literally take just five minutes to create this cake, well maybe 10 – not including baking time – I promise! Last week, for a special LunchFor1 – plus 1 luncheon here at Chez Echols, I whipped up my 5-minute Chocolate Fudge Bundt Cake for my friend Juliana. Yes, I freely admit that I’m a cheater when it comes to baking cakes. Since the mid-80s I’ve been a devoted user of Betty Crocker’s Super Moist Chocolate Fudge Cake Mix – just ask any of my former co-workers – it’s my “go to” secret birthday cake weapon. 4 ingredients to make the cake + 3 ingredients to decorate it = Yummy Bliss mmmmm CHOCOLATE! Simple. *Follow the package instructions as they can be different for different cake flavours. Just dump everything into your mixing bowl. Beat on low for 30 seconds, then beat on medium for 2 minutes more. a whisk, a hand mixer, or any stand mixer, of course. 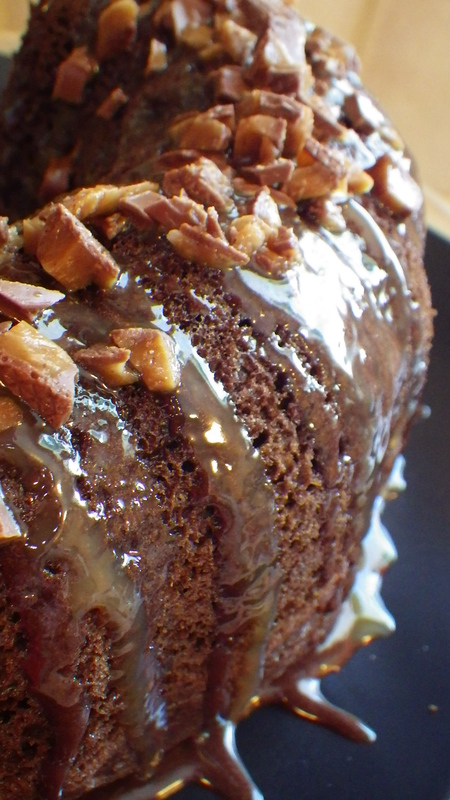 Spray your Bundt Pan generously with Pam and pour in your batter. Place into a pre-heated oven at 350*F for 35-45 minutes. Test for done-ness before removing. Let the bundt stand in its pan for 10 minutes, after you remove it from the oven. Turn out your cake onto your favourite plate. Let cool for another 30 to 60 minutes, or longer. Place 1/2 to 1 cup of the pre-made chocolate icing into a 1 cup measuring cup, and microwave for 20-30 seconds until your pre-made icing becomes pour-able. With a dinner fork, lightly punch shallow fork holes in the top, outer-sides and insides of your bundt cake. This allows the icing to seep into your already moist cake to make it extra delicious. Pour in a light drizzle back and forth over the top of your cake while turning the cake plate in a circle, and “paint” your cake with the icing. Also works great with two different colour icing, like chocolate and vanilla! This time I used some caramel sauce I had in the fridge along with the chocolate icing. Then I decorated the top of my cake with small chunks of Skor bars. Super easy – Super moist – Super tasty! VDAY TIP FOR MY GENTS… Hey guys – try this recipe to impress your lady with a special vday dessert at home… Simply bake a Super Moist brand vanilla cake mix the same as above. Use red and pink icing (or red & white) to drizzle over top the cake. Decorate the top with small heart-shaped sprinkles or small candies in the same colour scheme. I guarantee you’ll get “lucky” after dessert!!! Keep me posted! 😉 Watch for more Aphrodisiac Recipes coming soon! In the meantime, for more inspiration for February 14th – check out my Valentine’s Pins on Pinterest. BTW this cake was even better the next day after it sat in my domed, cake server! PLUS, this recipe is totally freezer friendly too. My husband and I cannot possibly eat a whole bundt cake, so I’ll slice it into individual pieces and freeze it for a later treat. Remember my portion control suggestions from my WeightReleaseUpdate#2? Sounds too hard? Don’t have that much time? Try my 3-2-1 Mug Cake recipe by clicking here. I LOVE making quick strawberry shortcake desserts for Jeff and I by using this easy method! Mug cakes work awesome at the cottage as well… sigh… Summer seems SO far away right now! What is your secret cake recipe? Please click Leave a Comment below and feel free to share it with me and my readers.